To Bathe or not to Bathe... That is the question. Now, I'm not going to talk about cleanliness here, just to let you know! 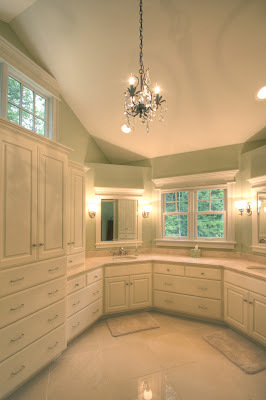 I want to discuss one of the most common questions I get when speaking with clients about their master bath. Which is, "Are people really doing tubs at all anymore?" While this is a very important thing to consider, I really want my clients to consider whether or not THEY would like to have a tub. Everyone is concerned about resale - I get it - but a tub isn't going to make or break a sale. It's much more important that you design your bathroom for you; not for the next Owner. To answer the question very generally, though, I do still have clients that love to bathe and want to have a tub. I also have a lot that know they won't ever use it, but they are afraid to not put one in. More often than not, though, most decide not to do one altogether because they know they won't use it. If you use a tub, design a space that is conducive to one. For example, if you only have one set of windows, don't set your tub near those windows, because inevitably, you will always keep the blinds closed and you will end up always getting ready in the dark. If the tub does end up by the windows, make sure you've planned ahead of time for the type of window covering that will be here; something that is accessible, pretty, and low-maintenance. Also, create a tub that is easy to get in and out of. You don't want to have to climb up steps and hurl yourself over the edge to get in and out of the tub. That's an accident waiting to happen. Consider doing a free-standing tub; these are great especially in smaller spaces because they make the room feel larger. Built-in tubs with large decks always make the room feel smaller. Allow for shampoo and body wash storage; ideally, in a hidden location. Most tubs look really pretty until all of your "functional stuff" is placed on the tub deck! If you only use a shower, make a comfortably sized shower for yourself. It should have a small seat inside and shampoo storage, ideally hidden from view from the rest of the bathroom. Be cautious not to make this space too large; every shower will be a rather cold one if the space is too large. Figure out what IS important to you since you may have extra space not dedicated to a tub. Linen space is a common request, and for the showering-types, it's normally a go-to option. So, if you know you would like to take baths and are willing to dedicate the space to one...go for it! If you know you won't use it, though, take that space and use it for things that you will use....key word here is YOU.